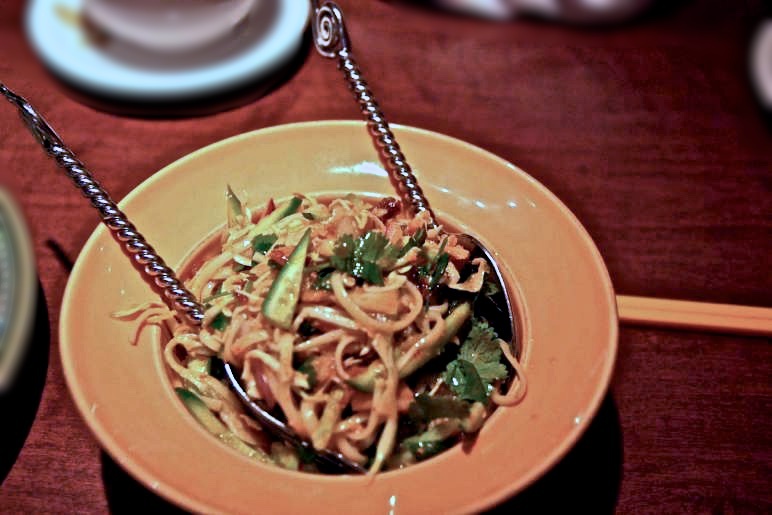 If you are a fan of Burma Superstar, but want to venture to a different Burmese restaurant in the Bay Area, then head to Mingalaba in Burlingame. Influenced by nearby countries such as India, China, and Thailand, it is hard to pin-point what exactly constitutes as Burmese food. Typically it is characterized by the extensive use of fish sauces, pastes, and other fermented fish products. It is not uncommon to find fresh fruits and vegetables being used in the same dish. Many traditional dishes are actually salads, which are centered around one major ingredient. We ordered the ginger salad which had a heap of pickled ginger in the center of the plate surrounded by dried shrimp, fried garlic, sesame seeds, and split yellow peas. The Tea Leaf Salad and Rainbow Salad (with no less than 18 ingredients) are also specials of the restaurant. My favorite Burmese dish is the Samosa Soup which is a dark and spicy soup filled with falafel, lentils, cabbage, green chilies and onions. All of the dishes we tried were full of complex flavors and the slices of pepper added a manageable amount of heat to the dishes.